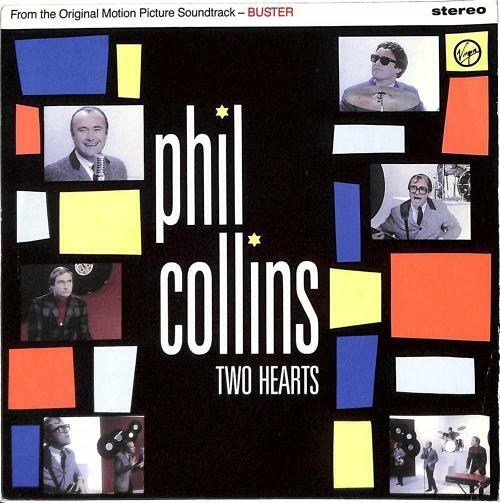 "Two Hearts" was released as the second single from the soundtrack to the film Buster, topping the music charts in the U.S., Canada, and Japan. The first promo single, "A Groovy Kind of Love", had previously reached No.1 in both the UK and US. The first track on side A of the Buster album, became the 89th best-selling single of 1988 in the UK. The single entered the UK singles chart at No.16 on November 29th 1988, making it the third highest new entry - Michael Jackson's "Smooth Criminal" entered at No.12 and Pet Shop Boys "Left To My Own Devices" entered at No.7. The single reached a peak position of No.6 on Nov 27th for two weeks, and spent five weeks in the UK top 10. It is played during the end credits of the movie. The track was composed and produced by Phil Collins and Lamont Dozier. The B-side featured another track from the Buster soundtrack, "The Robbery", which was composed by Anne Dudley and featured the London Film Orchestra - she scored the orchestrations on ABC's Lexicon of Love album, and worked on many 80s songs and albums produced by Trevor Horn. There were actually two music videos made, both of which were produced by Paul Flattery and directed by Jim Yukich. Tony Blackburn appears in the first video on a TV screen interviewing Phil Collins as part of the fictional band The Four Pound Notes - Collins played all four members. Blackburn tells Colilins "that's an unusual name for a band" and Collins replies "there used to be five of us". THe video mixed clips from the movie with the band performing on a stage. The other video sees Collins taking part in a wrestling match with WWF champion The Ultimate Warrior. Bass guitar was played by the American session musician Freddie Washington, electric guitar parts were played by Michael Landlau and tambourine was played by Paulinho da Costa. The single also reached No.3 in Belgium and Ireland, No.4 in Germany, Switzerland and Poland, No.5 in The Netherlands, No.6 in Norway, No.13 in Finland and Australia, No.14 in Austria, No.16 in Sweden, No.17 in Spain, No.22 in Italy and No.24 in France. 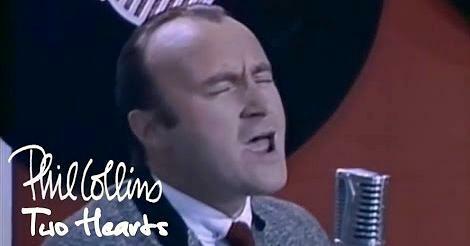 Collins played the role of the former train robber Buster Edwards in the film, alongside Julie Walters who played his long-suffering wife, June.